Venue The Fox and Hounds in Uffington. The specific menu will not be available until after Christmas as we understand they will be putting together a new menu, however you can look at this link to see what sort of food is on offer: http://www.uffingtonpub.co.uk/pdfs/autumn-menu-2018.pdf. Can you please contact Stephanie to reserve a place and let her know of any particular dietary requirements? Email address is s.haddrell@hotmail.com. It would be good to have an idea of numbers this side of Christmas, places are limited to 35 so please book early to avoid disappointment! 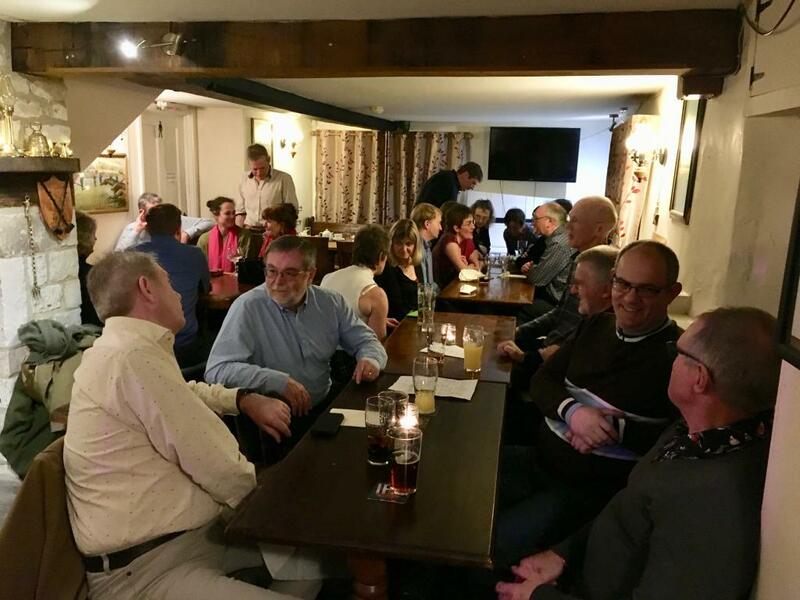 Cycling Wantage UK riders joined together to celebrate a successful year of rides at their Annual Club Dinner, held for the second consecutive year at The Fox and Hounds in Uffington. The group represented all elements of the club from elite former professionals, regular high milers (some of whom think 100k is a breeze! ), to the more genteel social riders, and newcomers who enjoy getting out for some social exercise, and the reward of some amazing tea and cake. As friends and cycling companions gathered, it was lovely to hear all recounting stories of recent club rides, the mountains which had been conquered over the last year, and the challenges which were being set for 2019. The Fox and Hounds were very accomodating, and provided us with some excellent culinary delights which were enjoyed by all. As you can imagine with a group of keen cyclists food is a serious priority required to fuel the body and satisfy the taste buds! I am delighted to report that the menu did not disappoint, with great variety on offer from courgette fritters, prawns, and mediterranean stuffed mushrooms starters; to lasagne, battered fish, sundried tomato, olive and spinach pasta,tuna, and chicken breasts stuffed with spinach and cheese as mains. For the truly brave there were also some equisite puddings, my sticky toffee pudding was a delight although I have to say that it beat me.... a case of 'eyes bigger than my belly' as my dear old mum would have said! Having enjoyed their meals the evening club provided members with an excellent opportunity to mingle and catch up with other members to share experiences discuss club rides as well as local, national and international events, and make plans for the future. Whilst many of us enjoy cycling at a pace whereby it is easy to chat and enjoy the scenery it was great to be able to chat with those members who we often don't see for dust! The camaraderie and experience within the group was a real pleasure to enjoy and one which I look forward to sharing in the years to come! Thanks to all for coming, and to Nicki and all the staff at The Fox and Hounds for making the annual dinner one to remember.